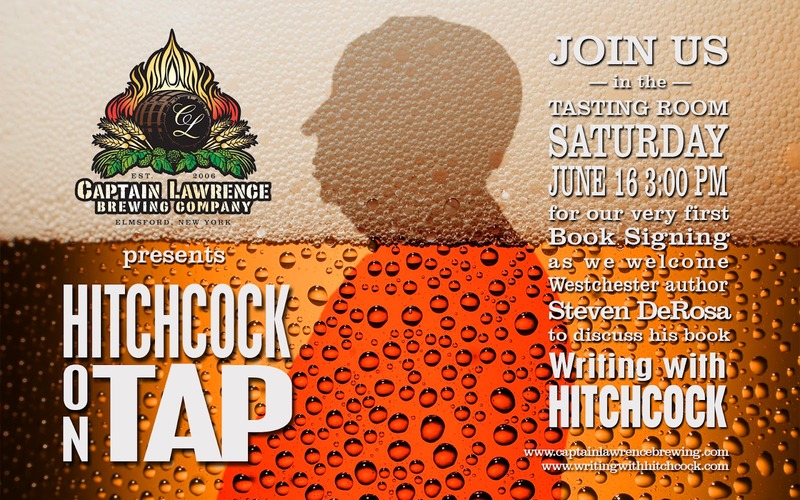 I can't think of a better way to spend a Saturday afternoon than combining two things that I love—Hitchcock and beer—but even more specifically, talking about Hitchcock movies and enjoying one of my favorite brews from Captain Lawrence Brewing Company. 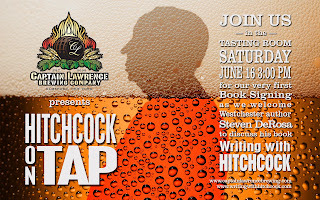 I am very pleased that I will get to do that this coming Saturday as they're hosting their very first book event—and honored that Writing with Hitchcock gets to be that book. Owner Scott Vaccaro and the team at Captain Lawrence have been producing some amazing beers since they opened in 2006. There's almost always a fresh growler of Imperial IPA, Freshchester Pale Ale, Smoked Porter, Espresso Stout, or Brown Ale in my fridge at home...and lately one of their specialty bottle-only brews as well. To commemorate Father's Day this weekend, they'll be offering their St. Vincent's Dubbel, a Belgian style abbey ale, named after Scott's dad Vincent. It's been on tap in the tasting room over the last ten days and it's a winner! Now in their expanded Elmsford facility, with food, a new bocce court and patio...Captain Lawrence has definitely become a place I enjoy to sample some great beers, hang with Bogie (my pug), and meet fun and interesting people. Please come for the reading, stay for the beer (or vice versa), and be sure to say hello. Hope to see you there.